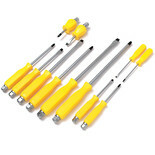 These screwdrivers are constructed from chrome vanadium satin chrome plated steel blades hardened and tempered with sand blasted tips. 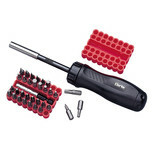 Soft grip handles with inserts. 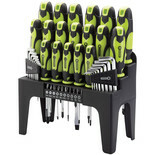 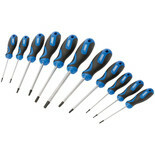 This screwdriver set consists of a range of screwdrivers including - Slotted: 6.5 x 38mm, 3.0 x 75mm, 5.5 x 75mm, 6.5 x 100mm, 8.0 x 150mm, Crosspoint; PH2 x 38mm, PH0 x 75mm, PH1 x 75mm, PH2 x 100mm. 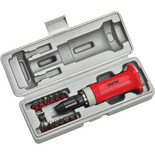 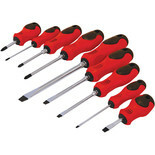 Suitable for a range of applications including driving in and removing screws. 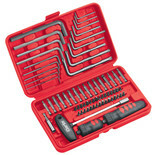 Bits, Allen keys and Torx keys all made from high quality Chrome Vanadium. 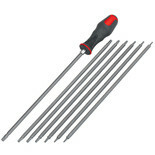 A quality set of magnetic tipped screwdrivers with professional quality, chrome vanadium hexagon shanks, extremely durable, matt black (pakerized) finished blades and precision ground tips. 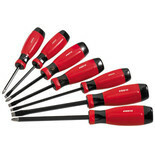 Made from hardened Chrome Vanadium steel for maximum strength & durability. 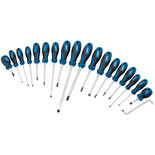 Assorted styles & sizes, including precision screwdrivers. 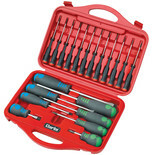 With comfort grip handles and supplied in a handy carry case. 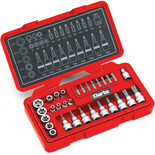 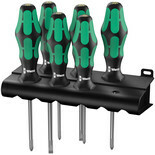 Five piece magnetic tipped screwdriver set, great for general DIY use. 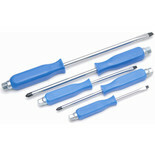 Moulded plastic handles means they're really comfortable to use too.